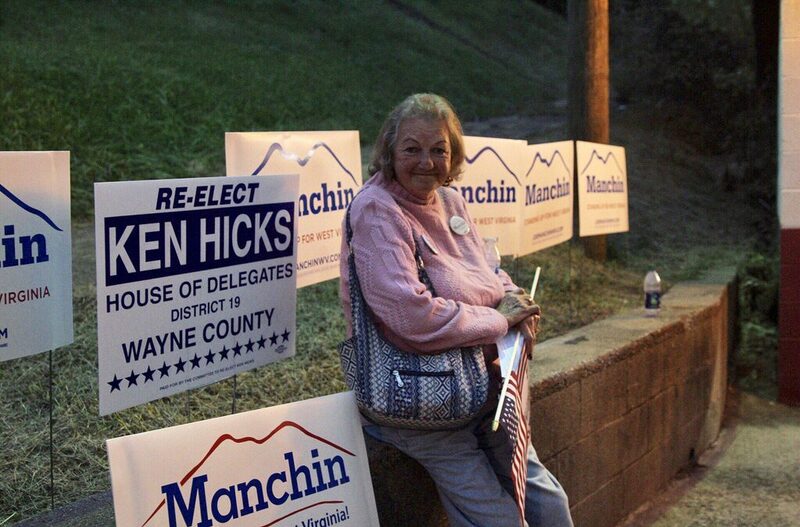 West Virginia resident Pat Webb attends a rally for State Senator and Congressional candidate Richard Ojeda and Senator Joe Manchin in Wayne County. WAYNE, W. Va. — Democrats are betting they can re-establish their lost footing in Appalachia, a region once dominated by moderate Democrats that now is more attracted to social conservatism, by running right-leaning candidates who draw on Republican rhetoric to appeal to voters in the Nov. 6 midterm elections. If the Democrats’ strategy in West Virginia, Tennessee and Kentucky succeeds, it could provide a blueprint for the party to expand its gains in other red states leading into the 2020 presidential race. If the strategy fails, it would leave Democrats nearly powerless in the region and call into question their strategy of moderate messaging. Once a powerful force in the party, conservative Democrats, largely from the South, have sunk to near extinction as the party moves left and its 2020 presidential hopefuls take progressive stances on race, gender and immigration. But in Appalachia, echoes of the previous political alignment remain. President Bill Clinton won Tennessee, West Virginia and Kentucky as recently as 1996. Kentucky’s traditionally Democratic state House of Representatives did not swing to GOP control until 2016. West Virginia sent a Republican to the U.S. Senate in 2014 for the first time in six decades. Tennessee, Democratic former Vice President Al Gore’s home state, has recently been dominated by Republicans at all levels. In these states, President Donald Trump won by over 20 points in 2016 and white voters make up over 75 percent of the electorate. One West Virginia Democrat could become a symbol of the conservative Democratic blue wave in the 3rd Congressional District, a longtime Democratic stronghold that Trump won with 72 percent of the vote in 2016. State Sen. Richard Ojeda, a 24-year Army veteran and former Trump supporter, is running against Republican Carol Miller, a state legislator and daughter of late U.S. Rep. Samuel Devine. Ojeda has the presence of a drill sergeant. He speaks fast and relentlessly, with statistics on the opioid crisis and broadband in West Virginia spilling over each other. Despite his current opposition to Trump, Ojeda’s populist language is reminiscent of the president. Ojeda said Miller “was born in the swamp” Because of her father. On immigration, he sounds like a Republican. The core message of Ojeda’s campaign is corruption and the political influence of the pharmaceutical industry. He vows to physically remove pharmaceutical lobbyists if they come to his congressional office. In ads, he’s accused Miller of profiteering from the opioid crisis, pointing to her ownership of stock in McKesson Pharmaceutical. Though Ojeda trails Miller by single digits in recent polls, he may be helped by being on the ballot with Manchin, who leads his GOP opponent by 16 points. Curtis Dreamer, an Ojeda supporter and student at Huntington Junior College, was drawn to Ojeda’s energy. “I hope he gets in there and shakes things up,” Dreamer said. Ojeda’ s military background appeals to conservative West Virginians, and more liberal candidates are using their military and intelligence experience to appeal to moderate voters. Thirty such congressional candidates are running on the Democratic ticket in this year’s midterms, many of them women. Military experience has long been associated with conservatism and masculinity, but in Kentucky’s 6th Congressional District, former Marine Corps fighter pilot Amy McGrath is expanding the possibilities for how Democrats hope to lure conservative and moderate female voters with strong national security messaging. Many voters insist McGrath is more conservative and point to her advertisements, which often mimic traditionally Republican messaging. In one, titled “Runway,” the opening shot reads “September 11, 2001” in dark lettering as McGrath describes her experience as a fighter pilot during the attacks. On an open aircraft runway, she criticizes Trump as weak and incompetent on national security. Barr outperformed Trump in the district in the 2016 election, winning a 6.4 percent greater share of the vote than the president. And the percent of registered Democratic voters in Kentucky has dipped below 50 percent for the first time in recent history. Tennessee’s Phil Bredesen is another case study in the viability of conservative Democrats in Trump country. Bredesen, a former governor, has run one of the most conservative Democratic campaigns in the country. He has touted an outdated “A” rating from the National Rifle Association while firing a gun in his ads. He has also emphasized fiscal responsibility and announced his support for Justice Brett Kavanaugh after Christine Ford’s testimony. While Bredesen’s triangulation may have helped him become deadlocked in polls against Republican Rep. Marsha Blackburn, liberal female voters expressed dismay at his support for Kavanaugh. If elected, Bredesen would be in the conservative wing of Democratic senators and could lead to contention between a liberal base and party leadership grateful to conservative Democrats for securing an influx of Democrats on Capitol Hill. Should he lose to Blackburn, her ascension to the Senate would solidify the state’s shift to the right and possibly mark the end of the Democrats’ viability in the state. If these three conservative Democrats are able to pull off victories along with other Democrats who are using the conservative to moderate messaging, it could set up a clash between the historically liberal base and the Democrats whose paths to victory were based on moderate positions. It could also fulfill Democrats’ desire to regain control of these historically working-class and rural areas that have drifted from the party.